$595. Vintage antique French style pink silk carved sofa by Interior Crafts. Established in 1951, Interior Crafts perfected the art of upholstery, woodworking and finishing under one roof. Day bed style sofa with high arms and low back. 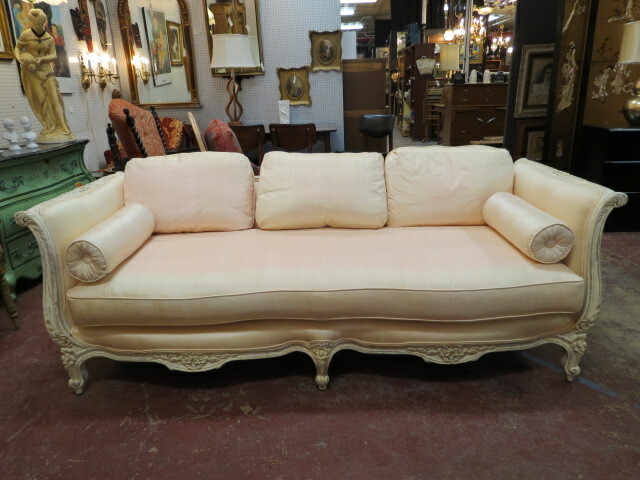 Frame is antiqued in cream with deep carvings all around. Serpentine front, cabriole legs. Upholstered expensively in a pink silk shantung. Down filled cushions in back, single seat cushion, bolsters. Perfect for your living room! Excellent condition. 82in wide, 31in deep, 34in tall.